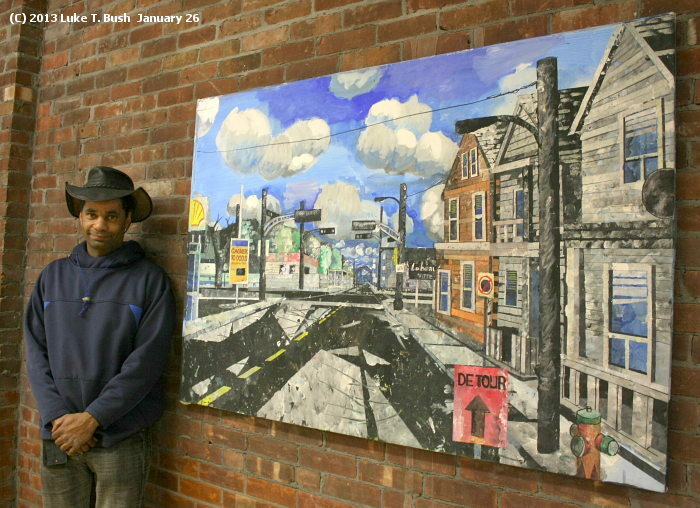 Artist Wayne Alexander Handley and one of his streetscapes. He starts with a base layer of light blue paint for the sky. 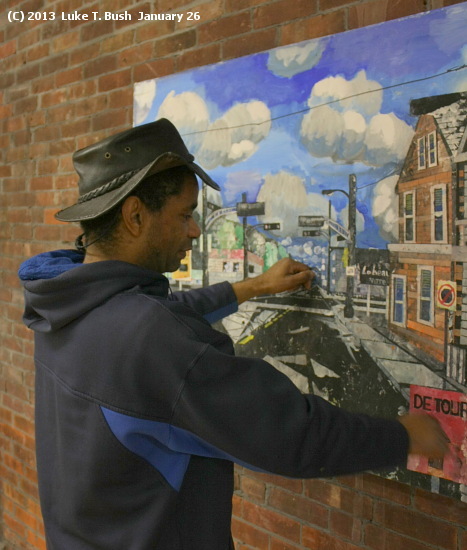 Then visual artist Wayne Alexander Handley adds more layers to the canvas for his recreation of a street scene. With three buildings in a row, he creates a separate layer for each one, one layer overlapping the other. This technique helps to bring an impression of three dimensionality to his work. To complete a street scene Wayne adds fine details with a colored pencil or a pen. Is the pen a special one for inking? No, he finds that a Bic pen will do the job. Wayne explained his technique to me during the opening of his exhibit at the ROTA Gallery Saturday evening. His bright streetscapes with warm blue skies and white clouds provided relief from the frigid winter darkness outside. While pursing a MFA degree in Fine Art and Education at Michigan Eastern University, he said, the emphasis with his study track was on human figures. Later Wayne decided to take on a new challenge, landscape painting, trying to master the perspective demanded by such artwork. His exhibit features streetscapes in various communities in Quebec and also American ones near the border. After scouting and locating a scene, Wayne takes a reference photo so that he can return later to the same spot and set up his plein air studio: chair, easel and needed tools. Sometimes people will stop and watch him paint, also enjoying the process of bringing a scene to life on a canvas. Another part of Wayne's technique involves the use of masking tape to measure and isolate various areas of a scene, a trick he learned from airbrush art. This helps him to bring out more dimensionality to his work. His exhibit runs until February 11 at the ROTA Gallery at 50 Margaret Street. ROTA is open daily from 12 noon to 5 PM, depending upon volunteer staffing. More info about the gallery can be found at rotagallery.com or by calling (518) 335-3994. Artist Wayne Alexander Handley demonstrates with an imaginary strip of masking tape how he measures and marks out sections while working on a scene. Anonymous cowards: go elsewhere with your baiting comments. I won't publish them. A while ago I received a comment from someone the hiding behind the cover of "Anonymous." And while there are times when someone should remain anonymous, this person's words didn't warrant it. This Anonymous remarked about a post I wrote about an event that was very emotional. I won't bother going into any great detail about what the commenter said – he (or she) would enjoy that – but I will give you the gist of troll's attack to show you why I won't publish it. Anonymous mocked the participants at the event, stating that they were narcissistics shedding alligator tears. The commenter also used the term sicko but ironically used it to describe others, not himself. So if you hear that I don't publish all comments, you now know why. I write this blog under my own name. If you want to comment, you can do the same and use your real name, giving me contact info to verify that you indeed made the statement. Even then I might not publish if it's only a petty ad hominem attack or simple baiting. I've modified the option at this blog so that only registered users, including those with OpenID, can comment. No more anonymous comments. You know there's nothing more that I like than walking into a coffeehouse to talk with some friends and have a verbal attack dog jump at me. A good way to start a New Year in Plattsburgh, NY. As I mentioned before a Facebook page I had created for a certain business was deleted without warning. My problem was with the person who erased my page while leaving hers the only one. I didn't have a problem with the business per se. This evening an employee behind the counter attacked me for daring to show my face in the business. If he didn't like how I handled the situation regarding the Facebook page he could've talked to me like a human being instead of trying to rip me a new one in front of everyone else. Apparently he feels I shouldn't have stated the facts online, just bit my tongue and said nothing. I've done too much of that in the past. I don't put up with anyone's crap anymore. This post is an example.